We promise to always be straight with our readers, so here’s the truth: Restaurants and food companies come up with dumbass, stunt ideas all the time so the media will go “Whoooooaaaaa” and write 500 words about it. We try to shield you from most of it. But sometimes—that one in 100 unicorn time—the novelty is worth our and your attention (See: Flamin’ Hot Cheeto-crusted turkey, Trader Joe’s Thanksgiving-flavored chips). This, friends, is one of those rare times. 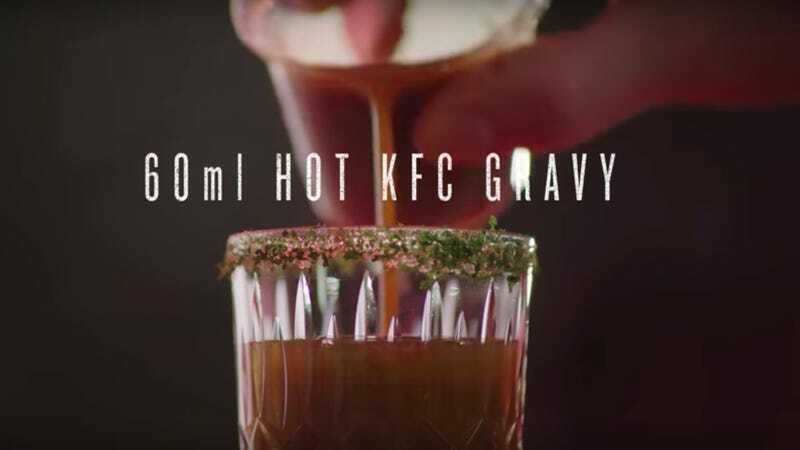 KFC U.K. and Ireland has released a trio of cocktail recipe videos that suggest you incorporate the chicken chain’s gravy into your next home libation creation. The Takeout has always advocated for both fat in cocktails as well as gravy in everything, so consider this our seal of approval. First up: The Southern Twist, a nearly equal-parts cocktail containing gravy and bourbon. (Watch the video but ignore its accompanying text, which clearly doesn’t match the visuals.) The gravy-whiskey duo sounds like spring break with Paula Deen, but I can imagine the bourbon’s spice actually melding with the gravy’s salty seasonings in an herbal-vanilla mashup that might not be too bad. Next offering: The Gravy Mary, a standard shaken Bloody Mary that contains a 20 mL dose of KFC gravy. Again, not that outrageous, considering meaty garnishes like bacon and beef jerky have always played well with this cocktail. Last up: The Fingerlickin’ Sour, a frozen gravy-mezcal-egg-white concoction that, on second thought, we really can’t get behind. While mezcal’s smoke and gravy’s “spice” makes sense, the egg white-plus-agave-plus-gravy situation just throws us off. Should you be brave enough to drink this and live to extoll its virtues, we’ll happily set the record straight.